Madan Dwadasi, or Madana Dvadasi, is associated with Hindu God Kama, the god of love. For some Hindu communities the day is associated with Lord Shiva. Madana Dwadasi 2019 date is April 16. It is observed on the 12th day of the Shukla Paksha (waxing phase of moon) of Chaitra month (March – April). The twelfth, thirteenth and fourteenth day of the waxing phase of moon of Chaitra month is dedicated to Hindu God Kama. Lord Shiva is also worshipped during the period. These days are auspicious to Hindu communities that associate the legend of Holi festival with Shiva burning Kama by opening his third eye. Kamdev was chosen to kindle the feeling of love in Lord Shiva who had entered into a deep meditation after the death of Goddess Sati. 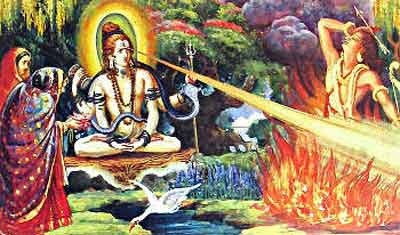 Kamdev knew that Lord Shiva was endowed with a fiery sight and disturbing him from his meditation is inviting death. But he performed the act so that the world that had gone lopsided with Shiva entering into intense meditation would be restored. What was feared happened and Lord Shiva burned Kamdev into ashes for disturbing Him. This sacrifice by Kamdev to save the world was not forgotten by people. Numerous rituals are associated with the sacrifice. Starting from Holi numerous rituals in India are based on this legend. The rituals include Thiruvathira Festival in Kerala, Dhulivandan, Kaman Pandigai, Madana Trayodasi and Anang Trayodasi. What do People Do on Madana Dwadasi? Hindus worship Kamdev and Rati on the day. Special prayers are also offered in Shiva Temples. In remembrance of the sacrifice, people observe fast from sunrise to sunset. Flowers and fruits are offered to people as prasad.